Of all of Lisbon's neighborhoods, it's hard to think of one more varied than Bairro Alto. Literally translated as "high town," the historic area uphill from the commercial Baixa district changes dramatically when the sun goes down. Very much the party zone of the Portuguese capital, it's a great place to visit, but pick somewhere else to stay unless you're a heavy sleeper or plan to join the revelers through to the small hours. No matter your interests, though, there's plenty to see and do for such a compact area. Whether you're there in broad daylight or well after sunset, these are the top eight things to do in Bairro Alto. Right at the base of Bairro Alto lies Miradouro de Santa Catarina, one of Lisbon's many spectacular viewpoints. Facing out to the Tagus river, it's a particularly good spot to make like a local and take in the sunset with a glass of wine. Get there ahead of time to secure a table outside the small cafe, but if it's too busy, just buy your drinks to go, and sit anywhere you can find a spot. Bands and street artists often perform in the late afternoon and evening, and whenever the sun's out, there's a fun-loving, friendly vibe. The viewpoint is easy to find: just keep an eye out for the statue of Adamastor, a mythical sea creature facing out towards the water. Just behind Miradouro de Santa Catarina lies the Museu da Farmacia (Pharmacy Museum), and on sunny days, you'll likely see people on the grassy terrace enjoying food and drinks from the attached restaurant. Once you make it inside, you'll be able to see the practice of medicine through the ages. Old apothecaries, traditional Chinese pharmacies from Macau, and other historical examples have been faithfully recreated, and items on display range from artifacts from ancient Egypt to medical kits from the Mir space station. Adult tickets cost €5, and expect to spend 1-2 hours inside. There's no shortage of bars with great views to grab a drink in Lisbon, but one of the best sits on the roof of a seven-level parking lot in the heart of Bairro Alto. The appropriately-named Park Bar transformed an ugly rooftop into a garden oasis overlooking the river, 25 de Abril suspension bridge, and the bell towers of the Santa Catarina church that sits alongside. It's the perfect spot to enjoy a fancy cocktail or two, and hosts events from outdoor cinema screenings to DJ performances. Park doesn't close until 2 am, with food (mostly burgers) available in the afternoon, and from 8-11 pm. Expect it to be busy on warm nights. Walking tours are a great way to see many cities, and as long as you don't mind a few hills, Lisbon is no exception. Several companies run tours in the downtown area, often departing from the large Rossio Square. One of the better options is the Chiado and Bairro Alto tour run by Discover Lisbon, although there are many others. Starting mid-afternoon, it takes in many of the sites in both neighborhoods over its 2.5-hour length, and like free walking tours the world over, you pay what it was worth to you at the end. Stay in Lisbon any length of time and you'll realize two things: it's a very beautiful city, and the downtown area is seriously steep. You can take anything from bus to metro, tram to tuk-tuk to avoid the hills, but the most interesting option by far is the funicular. Lisbon's funiculars have been running their short but very steep routes since 1884, staving off exhaustion for locals and visitors alike. The most popular with tourists is Elevador da Gloria, where street art-covered carriages run from near Restauradores metro station up to the Sao Pedro de Alcantara viewpoint. A single ticket costs €3.70, an expensive fare for the three-minute ride. It's included in the 24-hour Lisbon transit passes, though, so be sure to take advantage if you're buying one anyway. São Roque church, in Trinidade Coelho square, looks impressive enough from the outside, but it's the interior that really shines. Literally, in this case—the 16th-century Jesuit church is absolutely overflowing with gold leaf and gleaming marble columns. The Baroque decoration doesn't end there, either—lavish paintings adorn the floor and ceiling, while ornate chandeliers drop from the roof. If you can't get enough of the splendor, be sure to drop into the museum that sits alongside. Adult tickets cost €2.50 and give access to a wide and well-explained array of religious ornaments and artifacts. The Convent of Our Lady of Mount Carmel dates back to the late 14th century, and the Catholic convent was one of the most important pieces of Gothic architecture in the city. Severely damaged in the 1755 Lisbon earthquake that destroyed large swathes of the city, the convent was never fully rebuilt, and the ruins now stand starkly open to the sky alongside a small square. Today, the former alter houses a small archaeological museum, and the site often hosts classical music concerts in summer. Admission to the museum costs €4. 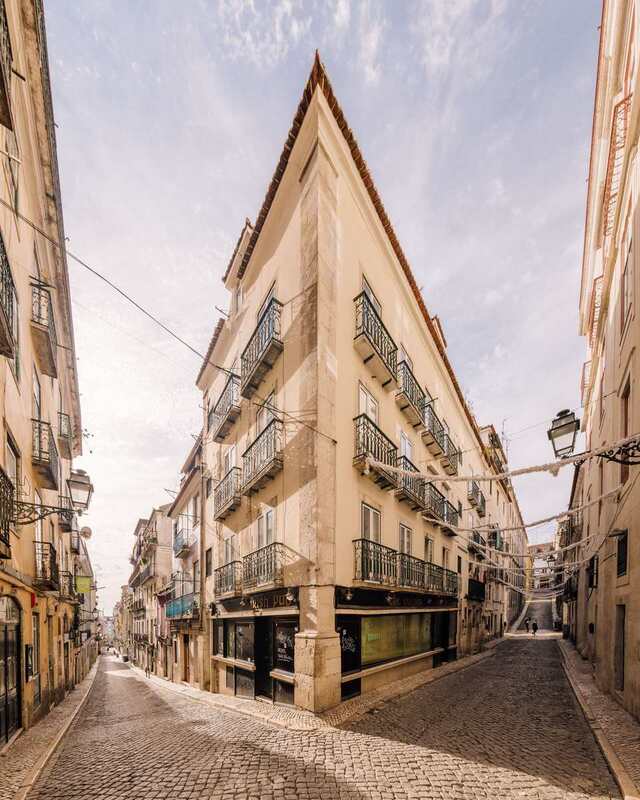 One of the most expansive viewpoints in Lisbon, Sao Pedro de Alcantara sprawls over two levels, with small, manicured gardens and unmatched views of the city and castle. It's spectacular at any time of day but comes into its own at sunset, when the castle is illuminated by spotlights and forms the perfect photo backdrop. Two cafes offer food and drinks, and there's often a tourist-focused street market in the late afternoon and evening. You can also do what the locals do, and find a table, open a bottle of wine and a few snacks, and enjoy the balmy Lisbon evening.